I had hoped, by now, to be able to discuss the new funding formula for public education in Mississippi. Unfortunately, that formula is still under lock and key. What I’ve heard about it is that it’s student-based rather that school based. The idea is that the state will allocate a certain amount of money per student, and that funding will follow the student wherever that child attends school. Regardless of the funding mechanism, though, our leaders would be wise to ask themselves what they want education in Mississippi to look like. Do they want to do the greatest amount of good for the greatest number of of students? That sounds like enforced mediocrity to me–so much for that Promethean urge. Do we want students in Mississippi to be better critical thinkers and writers? Do we want to track students so they’re prepared for jobs in industries? How can we balance liberal arts with STEM? In some ways, these are false dichotomies. It would be great if schools could be all things to all students. But there simply isn’t enough money to behave that way, so the more pressing issue becomes how to prioritize. I welcome your input. I can understand how some may consider individual funding a great advantage – and truthfully, it may be for some – but that will cost students who can’t afford to drive out of district to attend a different school so much more. When wealthier students with more concerned parents have the opportunity to leave a “bad” school for another with no extra cost, they will undoubtedly do so. However, this leaves those students who can’t leave with severely underfunded teachers and materials, causing the school to develop and even worse reputation – causing a cycle like the snake of ouroboros. The idea of funding for each individual is actually not a bad approach, if there is adequate funding. Instead of having masses of students being taught by underpaid teachers and essentially funneled through the public education system until they graduate, a specialized path could be determined for the student so that they would be engaged by school and actually lead successful lives doing what they find most interesting. More students would reach graduation, the general socioeconomic problem would gradually repair due to more people getting stable jobs, and Mississippi might finally be able to crawl out of this hole ti dug for itself so long ago. This, however, is what would happen in an ideal scenario. In reality, not enough money will be delegated to education and schools will still not receive enough money, teachers will still be underpaid, and another opportunity for progression in the Magnolia state will be wasted yet again. I know as silly as this sound, but I truly think that Mississippi state should allocate more funding to elementary schools. The experience that a child gain in elementary school shapes children views on education. If every student understands the value of education then every penny of the fundings will be used wisely regardless of which form the funding will be redistributed. As for the methods of distribution, although funding per students keeps it equal among students, the fund won’t be distributed equally throughout schools. For example, my old school has lots of fundings from oil and shipbuilding industries in addition to a large number of students. If the state were to fund students by allocating money per students, schools like my old school will have a larger advantage than in more rural area schools. I believe that the schools that lack private support should get more fundings than schools with lots of private support. The state can hire more employers to conduct on field assessment of each school and the schools budget. Then based on the report to generate a well-distributed budget. If the state were to provide a formula per students, the state should find a way to incorporate the environmental elements into the budget plan. I agree, my old elementary school was not lacking much, but compared to other Mississippi schools, it is just absurd. It is necessary that schools that are lacking that private support need more funding in order to educate the youth into better citizens. I believe that a school should be able to prioritize based on of what the student wants. This would call for more of a personalized schedule for each student and an end to the current credit requirement. Say perhaps we let each student decide whether they want to pursue liberal arts or STEM. From there we could have different credits requirements for the various paths, which could allow the students to take more classes that are catered towards or needed for their future success beyond high school. I don’t think that doing so would be a drastic change, but I do believe that it could provide a significant improvement to the success of graduates. I think the best option would be to allow some division between schools. Instead, there should be at least a slight division, such as with MSMS versus the rest of the state. At MSMS, the majority of our funding can go right to academics and easily secure the greatest amount of good for the greatest number of students. I believe the easiest way to do this is to have something like two schools per district: one focusing on academics, one focusing on vocation. Most districts already have more than one school; why not make a solid distinction between the two? I know many would argue there would be corruption when the rich kids get bought into the smart school, or there would be problems with sorting the students as best as possible, but that is present even now. 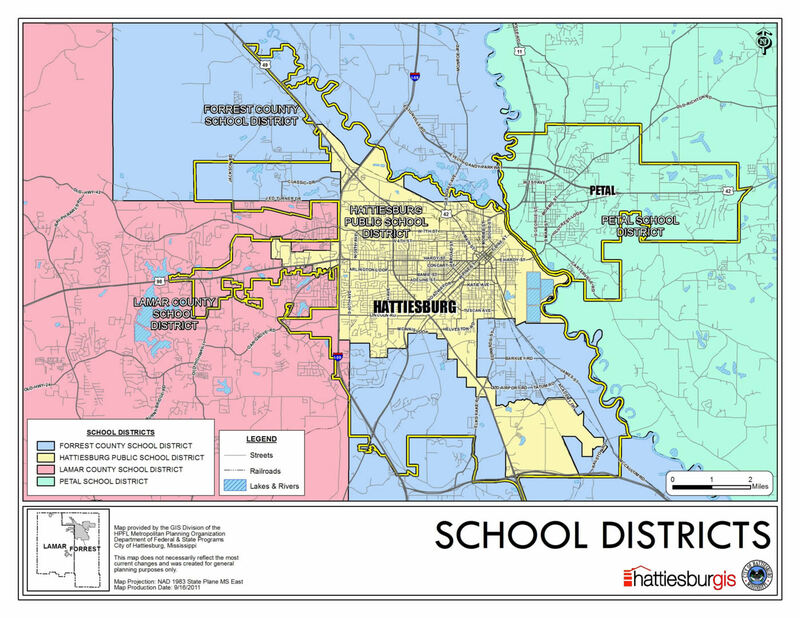 For example, the Hattiesburg metropolitan area school districts are strangely divided. There is a strange limb jutting out of the Hattiesburg school district into the Lamar county school district, where Oak Grove High School is. There is almost definitely a projects area there. I say this to say, there is going to be problems with inconsistency and money, but there always is. This is definitely an issue that I have mixed feelings about, as there really is no “correct” way to prioritize how schools or students should be funded. While I do think that it is critical that schools EdBuild is the new Jersey-based nonprofit hired by the Legislature hired to rewrite the state’s school funding formula, and its CEO told legislators that the state bears more of the cost of school funding than in most other states. One issue that needs to be addressed with a new system of funding is that some particularly wealthy school districts are actually receiving unnecessary subsidy from the state government, based off of the 27 percent limit rule. This rule states that the local district is not required to provide more than 27 percent of the funds calculated through the MAEP formula. EdBuild estimates that the 27% rule alone requires the state to spend some $120 million more on education than if the rule was eliminated and the state only paid for that portion of the local districts cost were not covered by the requirement. While I think that the 27% rule should be reconsidered, I do not think that it should be completely eliminated. Rather, it could be reformed to a higher percentage to decrease the amount of unnecessary subsidies that state is providing, and the extra money could be used as extra funding for the schools that are successful. The leftover money that is gained from the cessation from the unnecessary subsidies could be used in districts that actually need the subsidies.This way, achievement is awarded, and wealthier districts would not receive unnecessary subsidies anymore and other districts would be motivated to obtain more funding. However, one issue to consider here are the districts that have been trying to abide by the 27 percent rule, but have been unable to uphold it. I would have to perform more research about the topic to truly gain a better understanding about the issue, but I believe that a subsidy system could alleviate some of the financial stress that these districts face. Another concern that I have regarding the new funding mechanism that EdBuild suggested is related to the the nonprofit’s credibility. Apparently, they have worked with Connecticut and Georgia on school funding, but none of its recommendation shave been implemented, so Mississippi legislators should consider the reasons why those other two states did not take the advice of this organization before making any solid decisions. A student-based funding formula sounded like a good idea until I realized that we are only a school of around 235. Larger schools with less educational priority are favored in this formula and the schools with a higher concentration of intellectually gifted students are cheated out of potential funding. The idea of student-count based funding is a bad idea in general as it favors schools with a higher population and if the opposite scenario was enacted then the larger schools would have trouble supporting the students. The funding should be allocated in a better way, and although I do not have an idea as to how to do that, the minds of the legislature should be able to figure that out in a respectable manner. School should be a place for a student to grow and learn, but the key is that each student learn and grow differently. Attempting to promote the general good will not always make things better. Instead, it will make things worse. The education system for Mississippi should be flexible to accommodate every student’s needs, and because students are different from one another, it is a challenge very austere to overcome. The focus should be how can the education system of Mississippi best be applicable for Mississippi students that have different learning strategies and development? As I am the daughter of a very opinionated mother/elementary teacher, I have heard about money and not having enough of it to go around to schools in Mississippi and even throughout the rest of the United States, since I was able to understand what she was talking about. To answer the question of how do we hit all the points to have the students of Mississippi better and brighter than ever is to focus less of money on scores of test. A lot of public schools, especially the one that I use to go to, focused more on preparing students for tests that they would take and not on do they really know the curriculum. I was on a student/teacher/administrator/community leader board that was set up by our superintendent of our school district and it was implemented to better have an understand between the students and the adults of our community. Even though it seemed like a nice thing, we talked about classroom management and more about how can we improve it, to improve test scores. Why are test scores such a big thing? They should be done away with then I believe, we will eventually hit all the curriculum that is needed to be hit and our students will be more prepared and able to function out in the world. Cynically, the formula could be a way to spread less money further under the guise of helping the most students. Given that the MAEP has only been fully funded twice in twenty years, there isn’t enough money, so that’s why legislators think a formula change is needed now. Schools will need to decide how to use the money, and oftentimes, that involves stripping down school resources to the bare essentials. Electives tend to go first, and I think that reduces how enriching an education can be. I’m lucky my home school held on to electives because I enjoyed them, but other classes, like history and science, were often marginalized in their importance. The state-tested classes got the most attention. Focusing on state-tested classes might be the way most Mississippi schools respond to getting a variable amount of funding. There might be certain funding schemes for gifted or disabled students, but if there aren’t very many of them, then schools might be inclined to neglect those students anyway in favor of helping the most. It’s not something I agree with, and it’s a push factor for many who aren’t receiving the degree of education services they expect. I think that we should prioritize quality. Learning quality not testing quality. Teaching quality not just pay quality. Future goals not just college prep. I understand that there is not one for sure way to achieve everything wanted in education. I think that the idea of having an allotted money amount per student has its ups and downs. This means that the smaller schools have less influx of money and the large schools that already have lots of support get lots of money. On the upside, it gives a sense of every school getting treated equally for their students, not their population/social status. Maybe the money for the student could be statistically categorized to be used for that student’s best interest? Say several students want an art class, their money can be pooled together to create this art class. Of course, it might not work for all cases, but students interests in schools are not identified outside of the required classes and sports. Different schools can choose a different specialty. I know that Columbus city schools have certain areas that they focus on. Franklin Academy, for instance, focuses on medical sciences. Like I said, there is no fix. Just ideas to be thrown around. The state I feel like leans more towards stem and job preparation. They love to cut the art funds and cut the music funds. They hate to cut the sport or the ACT prep classes though. Students are not the same though. We need the diversity of topics for people to pick and choice from. Me for instance I love art ,but im also interected in robotics. I typical get cuts in my topics of interest. While I can begin to understand the thought process behind this idea, I definitely think this favors the more densely populated areas of the state opposed to the more rural, sparsely populated areas. The biggest question to be considered here is who generates more funding: the gifted or the challenged? Either way, someone gets left behind funding-wise. A plan must be created that eliminates a funding system that favors a certain group or area, leaving someone underfunded. I understand that this is a difficult task to receive, but a decision has to be made on the importance of education in Mississippi. This doesn’t seem like a plan I would agree with. What happens if the money runs out before the student is out of school? Or what if the money isn’t enough? I don’t like how the state pumps money into high rating schools (all schools except us which complete bull but…) and leave the lower performing schools for the wolves. What are you telling the students ? Because you cant do good on a test, a test that doesn’t necessarily track your intelligence, I’m not going to give you money. I strongly feel that some state legislators don’t expect students to perform well because if they did schools wouldn’t be in the position they are in now. Now, that I don’t like but I don’t think this student based thing is the best alternative. The entire education system needs to just try again. The idea of a student based funding formula for public education does seem like a system that will favor populated areas while drifting focus away from rural areas of the state. The main problem presents itself in what the state should support more financially, the educationally gifted or challenged. If the state were to implement a student-based funding formula celebrating intellect over attempting to lift inferior schools up, schools as successful as MSMS would receive loads of funding while schools performing poorly wouldn’t receiving the funding they would so dearly need to repair themselves. The inverse scenario is just as bad. Therefore, trying to allocate a set amount of educational funding presents a terrible dichotomy that always ends up with an underfunded group. Therefore, a student-based funding plan appears to be the most unbiased funding plan. Unfortunately, schools with low student populations take a massive hit, so a plan must be drafted that can eliminate the tendency of funds to favor a certain group.